Las Cruses Bed and Breakfast, the DreamCatcher Inn B&B de Las Cruces. 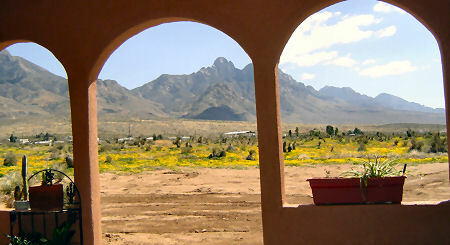 A beautiful Southwest Hacienda set at the base of the Organ Mountains. Just minutes from Las Cruces, shopping and restraunts; 20 minutes to NMSU; 6 minutes to NASA WSTF and 40 minutes to White Sands National Monument. Peace, tranquility and hospitality are top priority at DreamCatcher Inn B&B. Relaxing is a priority at this Inn, which offers magnificent views of both the Organ Mountains and the city lights in the evenings. Whether enjoying your spacious room and private bath, or sitting in one of several outdoor areas taking in the views, you'll be surrounded by serenity and beauty. Our goal at DreamCatcher Inn Bed & Breakfast de Las Cruces is to provide our guests with a restful, peaceful and comfortable environment to call home while visiting with us. It is our hope that when you leave us, you will feel refreshed and renewed, and you will plan to come and spend time with us again.